Come one, come all! Step right up as the first and biggest carnival comes to southern Metro Manila! 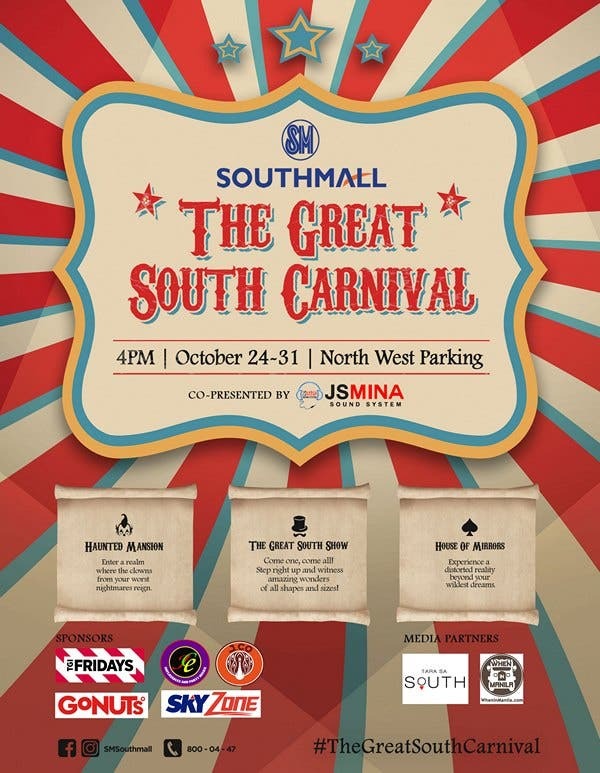 In partnership with JS Mina Sound System, TGI Fridays, J.Co Donuts & Coffee, JCE Inflatables and Party Needs, Go Nuts Donuts, and SkyZone, SM Southmall brings you The Great South Carnival on October 24-31. This Halloween, enjoy carnival treats under warm lights in the crisp October air with your favorite people. Witness wonders of all shapes and sizes at The Great South Show, where acrobats and other peculiar performers put on a show you’ve never seen before. A distorted visual experience awaits at a giant House of Mirrors, and eccentric clowns invade a Haunted Mansion for the creepiest adventure. One single receipt worth at least P500 from any store in SM Southmall. Two pairs of Bears of Joy – two out of four bears will be donated to SM Southmall’s chosen children’s beneficiary at the end of the Christmas season. For more information, like and follow @/SMSouthmall on Facebook and Instagram.